I found this interesting vacation rentals website. It allows the owners of vacation rentals to list their properties on the website. You as the traveller can then contact them directly to book your holiday rental. They cover a number of destinations worldwide including Paris vacation rentals and London vacation rentals. I always think that a holiday rental is nicer than staying in a hotel, due to the fact you have a lot more privacy. Often it can work out a lot cheaper as well, so can be good for people travelling on a budget. For example I found a vacation rental in Oxford which starts from just £30 a night. A second Portuguese Man-o’-War jellyfish has been found in Cornwall. The jellyfish was washed up at St Ives, near where the last one was found, a few days ago. People are urged to be cautious when visiting the area. Anyone stung should immediately remove any tentacles and immerse the affected area in either hot or iced water for 20 minutes. I came across this website the other day that offers short term rentals in Vilnius, Lithuania. The idea is that instead of booking a hotel you can book one of their rental properties. They are available for anything from a few days to a few weeks and can often work out cheaper than staying in a hotel. They also offer a lot more space and privacy than you would have if you stayed at a hotel. Another reason to go for a short term rental is that you can be a bit more flexible, not having to be back at a certain time for meals, as you would have to be at a hotel. This website specialises in rental in the Old Town which are within walking distance of the cities restaurants and shops. All the apartments are fully furnished and many also have internet access which is always useful. The World Health Organisation has warned that people are more at risk of contracting an infectious disease because of cheap air travel. Their report says that new strains of diseases such as influenza, malaria and tuberculosis are thriving and that more drug resistant mutations are becoming common. The problem is that it can be hard to confine a disease to one geographical area, due to the fact that people travel so frequently. The article highlights a case where an American lawyer who was believed to have tuberculosis. He had travelled around Europe and could have infected another 127 people with the disease. Although it was later confirmed the man has a less serious form of the disease, it still shows how a disease could spread very quickly. Some of the Terracotta Warriors discovered in Xian in China are coming to Britain. The figures are over 2000 years and have been loaned to the British Museum for an exhibition. If you want to see tickets are available on the British Museums website and cost £12. The exhibition runs from 13th September 2007 to 6th April 2008. This weeks travel blog of the week is Travelling Stories Magazine, made up of those interesting travel stories we hear in between destinations or at rest stops from fellow travellers while on our way to our next destination. Its a brilliant idea and makes a fascinating and at times hilarious read and for that I thank its editor Michael Warren and the many travellers who have contributed to Travelling Stories Magazine. One of my favourite articles is Things My Father Told Me to Never Tell My Mother, it's a funny tail about all the escapades a young man and his father got up to while growing up. From fishing trips to drunken brawls in bars and the unspoken bond of silence never to tell his mother what they got up to. If you are heading down to Cornwall this bank holiday weekend you might want to be a bit cautious. A Portuguese Man-o’-War has recently been washed up on the beach at St Ives. Whilst there is no need to panic, the creatures can cause fatalities and holiday makers are being asked to report any sightings of the creature. As always when we have a Bank Holiday in the UK, travel chaos has been predicted. This weekend is meant to bring some sunshine, so is likely to prompt people to flock to the coast. The worst affected roads are likely to be the M1 and M4 out of London, the M5 from Bristol, the M6 Northbound and the M55 to Blackpool. It is also thought the M25 is likely to be gridlocked in both directions. Drivers have been advised to avoid travelling at peak times and to expect long delays. The Vatican has announced that it is going to launch a low cost charter flight service for pilgrims. The service will transport pilgrims to holy sites worldwide with the first flight being going from Rome to Lourdes. Other destinations could include Fatima, Santiago di Compostela and the Holy Land. The planes will be decorated with sacred inscriptions and the cabin crew will specialise in voyages of a sacred nature. Currently around 8 million pilgrims travel to Lourdes every year so the service is likely to prove popular. Royal Mail has announced it will introduce free postage for parcels sent to British troops in Afghanistan and Iraq. A further announcement with details about when the free service will be introduced in expected shortly. If you are visiting China you might want to go to Xian within the province of Shannxi. The city has a rich history, it was once thought to be among the greatest cities in the world and since the 11 century BC eleven dynasties have ruled from there. Today not much remains of its grand legacy except for the intact city wall. The city is, however, renowned for the famous Terracotta Warriors that were discovered there, so it is certainly worth a visit. The Terracotta Warriors are the main attraction in the area. They are around 45 minutes drive from the city centre so it is probably best to go for an arranged tour from one of the many Xian hotels that offer them. It's worth combining visiting the Terracotta Warriors with a visit to Ban Po Village which is nearby. The village is one of the best examples of a Neolithic settlement in China and is over 6,000 years old. It has over 40 excavated houses, kilns and cellars and over 250 graves on display. This week's travel blog is travelhappy written by Chris Mitchell a British travel writer based in Bangkok. One of his more entertaining articles is about what he calls "Engrish", for those of you who are unfamiliar with the term; it's the way that the English language can get somewhat mangled in Bangkok. He points out some humorous signs in "Engrish" as well as some really entertaining T-shirts, some of which are a little rude to mention so we decided to highlight the Arrogant and Bear pencil case instead, pictured below. Another really interesting article is a video showing swimming with sharks. The video was shot in South Australia with a Canon IXUS camera, and although the clips are short, it is fascinating to see shots of these amazing creatures so close. The videos feature Great White Sharks. For the safety of the diver the video is shot from within a shark cage. In the first video the shark passes within touching distance to the diver and in the second we see a shark approaching tuna fish bait and the amazing speed at which the shark can strike out of nowhere. Madrid is the largest city is Spain and is best known for it cultural and artistic heritage. One important thing to remember when visiting is that due to the extreme heat many people take a siesta at midday; so many stores are likely to be closed at this time. You will find however, that many bars are open until 6 to 8 in the morning. It is important to bear this in mind when choosing Madrid hotels, as places near to bars are likely to be a nightmare for light sleepers. Some attractions to visit include the Museo del Prado which has one of the finest art collections in the world including paintings by Goya, van Dyck, Botticelli and Albrecht Durer. The National Archaeology Museum is also worth a visit. It contains exhibits from Prehistoric to Renaissance times many of which were removed from churches and monasteries. The biggest attraction of the museum is a replica of the prehistoric cave paintings featuring bison, horses, and boars discovered in Altamira, Cantabria. You can find some cheap hotels recommendations at HotelClub before you go away. The information they provide on the accommodation is quite detailed including a good description of the room and the location as well as a break down of facilities. If you book online you can also benefit from cheaper rates than if you were to book directly with the hotel. All the hotels offered on this site are also ranked by people who have been there previously, which is a useful indication of the quality of the accommodation. The number of claims for lost luggage has increased twofold this year. The travel insurance firm Insureandgo has seen an 85% increase in claims, so far this year. The figures show that British Airways has been the worst airline for losing customers luggage. Sydney is Australia’s oldest city and has an interesting blend of the old and the new. Whilst the Opera House attracts those seeking a bit of culture, it also has a vibrant nightlife in the Kings Cross area. There is also wealth of things to do in Sydney including visiting Sydney Wildlife World and the Sydney Aquarium. If you are planning a visit you might want to check out these Sydney hotel deal before you go. Darling Harbour is well worth a visit. It is a lively waterfront precinct, with an abundance of Darling Harbour Hotel accommodation close to the nightlife and the Darling Harbour Exhibition Centre. King Street Wharf is the place to go for sleek dining establishments or the nearby Cockle Bay Wharf offers waterfront promenades and alfresco restaurants. Melbourne is Australia’s second largest city. It combines Victorian-era architecture with museums, art galleries and spacious landscaped parks. Here you can enjoy a stay in a nineteenth century Melbourne hotel and a glass of the local chardonnay. The area also has some of the best shopping and nightlife in Australia as well as offering many specialised restaurants. Royal Mail has been given the go-ahead to increase the price of a second class stamp. The rise could mean that the cost of a second class stamp could rise to 29p by 2010. The price increase which has been approved by the regulator should help Royal Mail to tackle its deteriorating financial situation. All Inclusive holidays can be a good way to stay within your budget when going away. Although it means you might pay a little more for you holiday up front, once you are there you don’t have to worry about the final hotel bill because all your food and drink is included in the price. If you are taking the family away then an all inclusive holiday can be a good idea because a lot of sporting activities and entertainment is also included in the price. www.otbeach.com currently has some good deals on destinations including Egypt, the Caribbean, Dominican Republic and Turkey. By booking online with them you can save up to 40% off the high street price. I came across some surprisingly cheap deals to Egypt that actually worked about the same as a regular holiday. It seems very reasonably priced particularly when you think it includes all your food and drink. If you are a red head you might want to head off the National Botanic Garden of Wales. They are holding a Ginger Family Festival on the 26th of August to celebrate the ginger plant and they are offering red heads the chance to get in free. The festival will have home made ginger beer and a ginger themed menu and will generally celebrate all things ginger. Eurobookings provides a good resource for people booking a hotel within Europe. Their Europe hotels guide provides an inside view into some of the top travel destinations and hotels around the world. The United Kingdom guide has an interesting article on the British pub including information on how to order a round of drinks, which being British myself, I go without thinking. It does also contain a London hotels guide which is very useful when planning a trip to London. I find it is always best to check out the hotels the in an area because it is often nicer to book a room and come home the next day rather than rushing to catch the last tube. The Amsterdam hotels guide is also useful. The guide allows you to view the hotels on a map and also shows you the price of each hotel. There is also detailed information on what to expect when you get there, even down to which credit cards they accept. A lot of the hotels have reviews from people who have already been there, so you can make an informed decision before booking a hotel, and I always feel better when I can see recommendations from real people. Airlines have been ordered to display the full price of plane tickets on their websites after it has emerged they were covering up the total cost. The problem is that many airlines advertise a low price to draw the customer in and only show the total price including the taxes and other additional charges later in the booking process. Some airlines add as much as £25 in extra charges on top of the advertised price. The Cheap Family Vacation Planner is as the name suggests a family orientated blog filled with tips and advice for parents taking their little kids or teens on holiday. As I have experienced when going on holiday with friends who have children, that its a bit akin to mobilising a small army. The blog offers tips on how to keep kids occupied on long car journeys, what to pack, how to be safe and suitable holiday destinations. The one thing I like about this blog is that it shows that family holidays don't have to just be about amusement parks and sea side resorts but can also be as exotic as ancient Mayan cities. One of the most amusing articles is Six Unavoidable Items to Pack While We Go, Do You Dare? which lists duct tape of all things as an essential item to pack. However I strongly agree with taking a portable door lock with you especially when staying in a place you have never been before. PC2Paper.co.uk has been named by The Times as one of the top 100 travel websites. The Times lists us under the Travel Essentials category which includes insurance, money, health and communications. Here at PC2Paper we are always happy when we receive good feedback on the service we provide, we are certainly pleased we made it onto the list. The latest postal strike has been suspended as Royal Mail agree to meet the Union for talks. The talks will be held at the TUC and both sides are committed to reaching an agreement by the 4th of September. No further strike action will be held whilst the talks are being held, meaning its service as normal, here at PC2Paper. Postal workers are to stage a further strike as part of the ongoing dispute over pay and conditions. The strike will start tonight with mail centres and airports going on strike from 7pm tonight until 7pm tomorrow. Delivery staff will strike from 7pm on Friday 10th to 7pm on Saturday 11th. During this time any mail sent within the UK will be delayed. 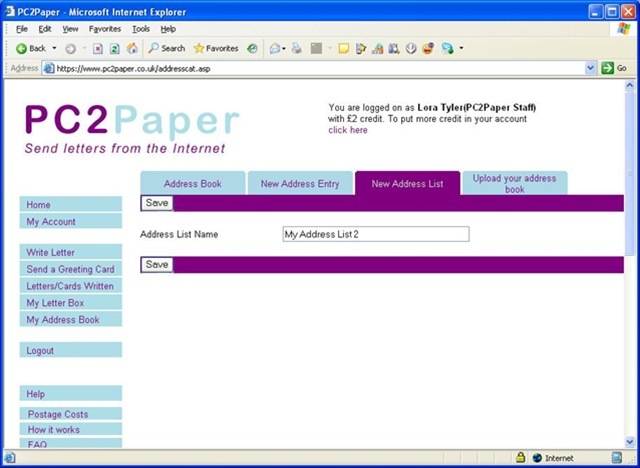 US and European mail sent via PC2Paper will remain unaffected. British Airways has been named the worst airline in Europe. A report compiled by the Association of European Airlines showed that British Airways customers were more likely to encounter delays than people travelling on any other airline. Between April and June 35.7% of medium and short haul British Airways flights did not arrive on time, with the airlines performance on long haul flights even worse. 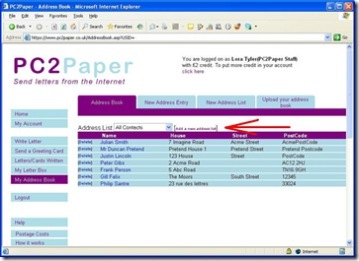 PC2Paper now allows you to upload your contacts as a spreadsheet file. 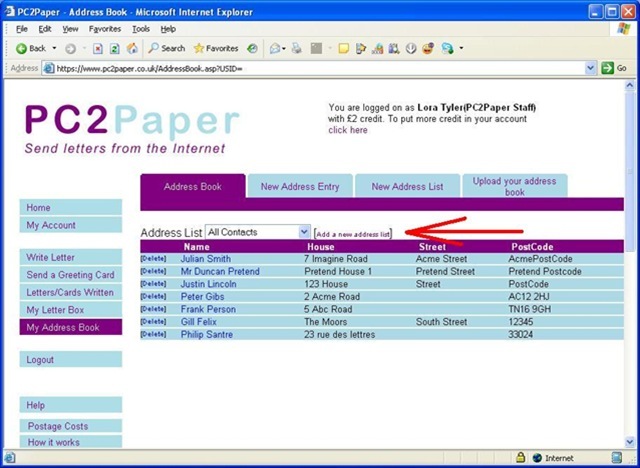 you will find a new option here called Add a new address list, click on it. You will now be asked to give your address list a name. Give your address list a name and then save it. On the next step select Upload an address list. 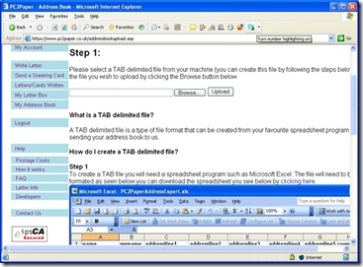 You will need to follow the instruction carefully on this page on how to format your spreadsheet a sample spreadsheet is available for you to download in MS Excel format to see how its done. 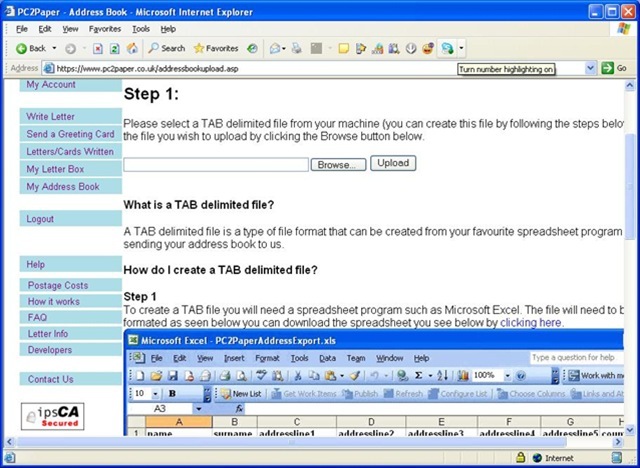 Once you have formatted your data correctly in your favourite spreadsheet program you will need to save it as a TAB delimited file. When representing different countries in your spreadsheet you will need to use the PC2Paper country code a copy of which is available for download here the default for the UK is 1. Save an MS Excel spreadsheet as a TAB delimited file from Excel by click File > Save As and then selecting Text (Tab delimited)(*.txt) in the Save as type: dialogue that appears below. This week's travel blog is A Month in Venice by Richard Callaby. As the title suggests the blog charts his trip to Venice and aims to provide useful information for people thinking of visiting Italy. Some useful articles include where to get the best slice of pizza in Venice and some tips about which hotels to stay in. There is also a useful article about getting internet access in Italy which I find is a necessity when I go away. Richard points out that many hotels in Italy do not have wireless access in the rooms. He does, however, provide some useful information on how to find the nearest free wifi connection. Another useful article talks about how to set up a portable office. 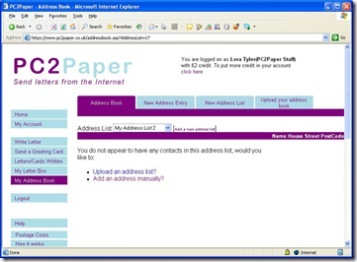 Richard talks about how to set up a free email account, setting up a portable fax service and also using a mail forwarding service such as UPS. One thing he might not be aware of here, is that PC2Paper offer an online mailbox where any letters sent are scanned in and made available to read online. This service is often much faster than mail forwarding. Richard also talks about how to set up a VOIP service, although points out that this does rely on having an internet connection so can be subject to problems in Italy. European mobile phone users are now befitting from lower charges under new rules brought in by the EU. British customers, however, will have to wait before it applies to them. Orange, T-Mobile and 3 are delaying making the change for as long as possible and will only switch customers to a Eurotariff on the 30 August. Staff at Sighthill sorting office in Edinburgh are staging an unofficial strike today after four worker were suspended. Deliveries to the surrounding area are likely to be affected with mail being delayed. Due to a national postal strike, there will be no deliveries or collections on Thursday 2nd August. During this time all mail sent via PC2Paper will be posted as usual but customers are advised to expect delays. Mail is likely to be delayed for several days after this latest strike. PC2Paper are unable to guarantee any delivery times during the strike. Mail sent via are US and European printing station is unaffected.